Forest Policy Research » Blog Archive » Brazil: First complaints of corruption eliminates Minister Silva, is Minc next? Brazil: First complaints of corruption eliminates Minister Silva, is Minc next? After a meeting with President Luiz Inacio Lula da Silva on Thursday last week, Minc told reporters that government ministers "are going behind his back to Congress, 'each with their little hatchets, pushing amendments that tear to pieces and disfigure environmental legislation,'" according to the AP. "I explained to President Lula that the (environment) ministry is under attack," he was quoted as saying by Reuters. "The environment is being attacked by Congress and society." Minc has taken an active role in battling Amazon deforestation, reducing credit access to illegal loggers and ranchers, seizing agricultural products and cattle produced on illegally deforested lands, and pushing for new protected areas. His efforts have angered powerful development interests and at times have put his at odds with President Lula, who is promoting new road and hydroelectric projects. Still Minc told reporters that Lula supported him on "six of the eight issues he raised, including a ban on sugar cane planting in the Pantanal," according to Reuters. 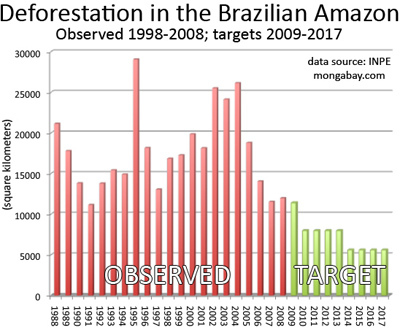 Last year President Lula unveiled an ambitious program to reduce Amazon deforestation by 70 percent from a 1996-2005 baseline, although bulk of the cuts are targeted for after he leaves office. Lula hopes to finance the $21 billion plan by soliciting donations from industrialized countries. To date only Norway has committed funds.